Just a pre-warning that the bandwidth for the server is almost used up for this month (thankfully the month is almost over), so if it does reach the limit the site may go down until it is reset at the start of the next month. I'm upgrading the deal that the site is on so hopefully this won't be a worry again. The positive thing it represents is that the site is getting more and more traffic all the time, so it is good we're getting more and more new and repeat visitors. So "every cloud..."
Well I've been real busy of late with final preparations for the WF Awards Show and other things so hadn't gotten around to doing any updates lately so thought I'd just put up a quick reminder that tonight is the awards show. 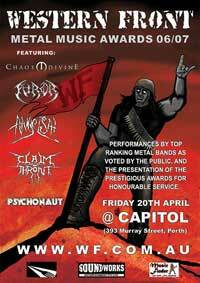 With some of the top bands playing - Psychonaut, Chaos Divine, The Furor, Angelsai and Claim The Throne - it should prove to be an awesome night. Don't forget that the winners of all the awards shall also be presented so make sure to get along to find out. It's at Capitol on Murray Street, Perth and doors open at 8pm with the first band on at 8.30pm. It is always a huge event so hope to see you down there. Well the voting for the Western Front Awards '06/'07 is now officially closed. Thanks to everyone that voted. To find out the winners in all the categories come on down to the awards night on the 20th of April. 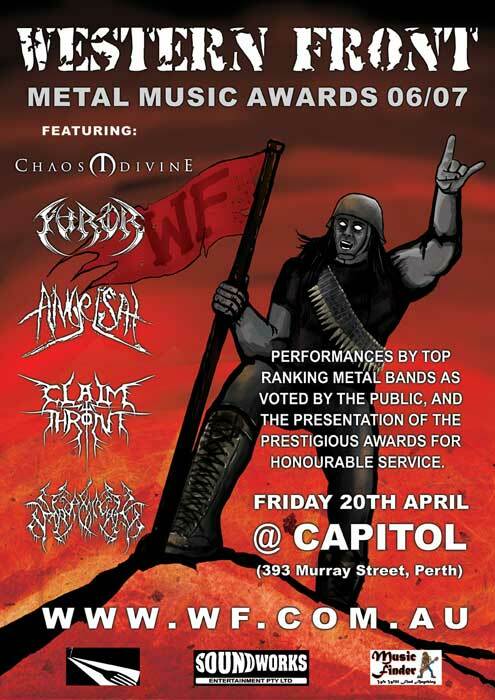 It will take place at Capitol (393 Murray Street, Perth) and will feature performances by the top voted bands as voted by you, the metal public. Just a reminder about the voting for the Western Front awards - voting will only go for another week so make sure you've lodged your choices if you haven't already. The awards show and presentations will take place at Capitol on April 20, and as usual will be set to be a huge night with performances by the top rating bands. 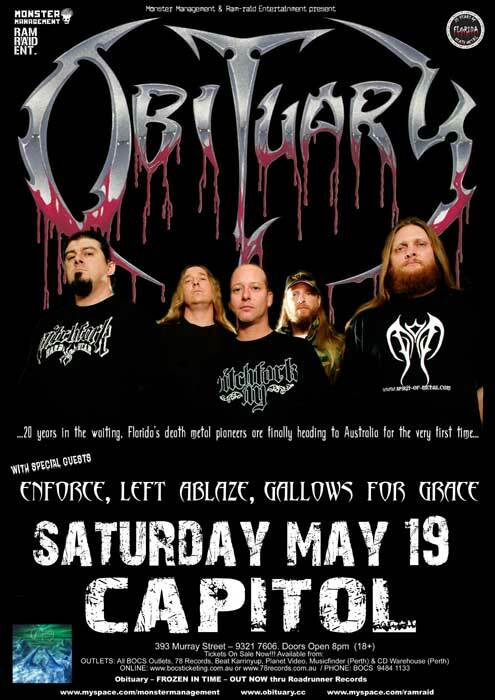 Well if you haven't heard yet, Obituary will be playing here in May - the artwork I've been sent is for the Perth show on May 19. 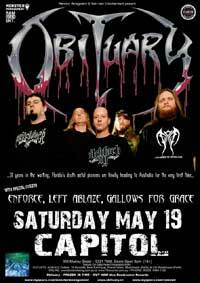 An awesome old school death metal band playing here on a Saturday night... oh yeah, this will be huge. Their first time to Australia but I got to see them a few months back in Germany and can tell you, they're still rocking hard after over 20 years of pioneering death metal in Florida.